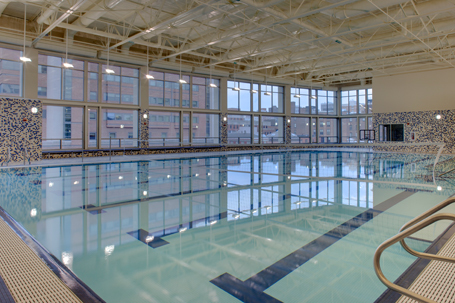 TheUniversityofMaryland,Baltimore, commissioned WTW Architects in association with Counsilman-Hunsaker to design a state-of-the-art swim complex located on the 4th floor that would provide both fitness and recreation programming activities. The objective was to create a vibrant new campus center that would serve as a catalyst for student programs, public events and a new sense of community spirit. The added challenge was to construct this facility on a tight site. The resulting five-story facility combines 60,000 sq. ft. of student life components with a 40,000 sq. ft. recreational/fitness/wellness center that also includes dining and lounge spaces, a 250-seat banquet room, student-organization offices, and conference and meeting spaces. Highlights include a comprehensive fitness center, a five lane lap pool, a wellness center and a rooftop patio. The top floor of the facility connects to a gymnasium and fitness area located on the top floor of an adjoining parking garage. The fitness center features 90 cardiovascular stations, free weights, functional trainers, and an elevated walking and jogging track. Recreation programming includes two exercise studios, a cycling studio, multipurpose areas, a gymnasium with two basketball courts, volleyball courts, and two racquetball squash conversion courts.